National Honor Society in English founded in 1924. This organization is for students who major or minor in English, Theatre or Secondary Education/English with a grade point average of 3.4 or better in English, Theatre and Writing courses and an overall grade point average of 3.4 or better. The University's Mu Omicron chapter first met in April 1980. Co-Moderators: Dr. Rebecca Beal and Dr. Billie Tadros. 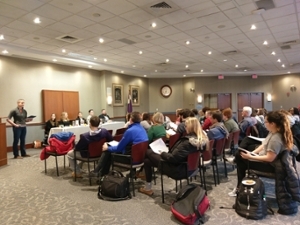 Members of the University of Scranton's chapter with support from the Jesuit Center, presented a Round Table titled, "Peck Small Tracks": A Jesuit reading of Tess Taylor's Work & Days and Pope Francis's Laudato Si', 5:30 p.m. Thursday in Brennan Hall, the Rose Room. The event was free and open to the public. In attendance were members of our faculty, staff and students and a fun time was had by all. Good luck to Cara Charles, Emily Carr, Phyllida Whittaker, Matthew Criscione and David Rakauskas as they will represent The University at this years convention held in St. Louis, MO. Pictured from left to right: Phyllida Whittaker, Emily Carr, Dr. Billie Tadros, Matthew Criscione, David Rakauskas. Sitting: Cara Charles. 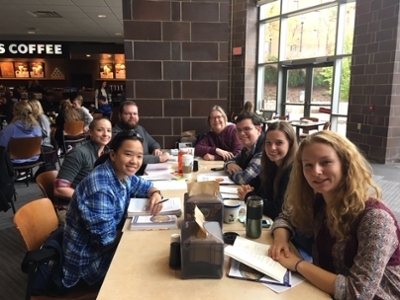 Five of our Sigma Tau Members; Emily Carr, Cara Charles, Matthew Criscione, David Rakauskas and Phyllida Whittaker have been meeting weekly with Dr. Billie Tadros to develop a round table discussion exploring Work and Days, this year's Common Reader, through the lens of Laudato Si. Pope Francis' encyclical on the environment. 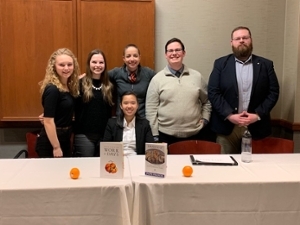 As a result of this extra-curricular work, the students are planning an on-campus round table followed by a presentation at this year's convention in St. Louis. Accordingly, they have submitted a round table proposal to the convention organizers and applied for a U of S Humanities Initiative Undergraduate Award for Humanistic Inquiry to support their travel. 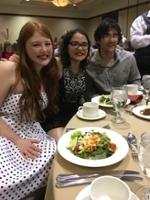 Cara Charles and David Rakauskas, also individually mentored by Dr. Tadros, have also submitted proposals to present individual papers at the Convention and have applied for Undergraduate Awards for Humanistic Inquiry to fund these presentations. The 2017-2018 Sigma Tau Delta Annual Convention was held in Cincinnati, OH. 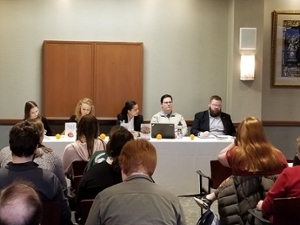 We were honored to be represented at the convention by three of our student members who read their original works: Peter Shaver ("Unknow American Town"), Erica Westlake ("Woolf as a Guide to Re-Create Antoinette Mason"), and Daniel O'Reilly ("Stumbling through Service"). Our local Mu Omicron chapter of Sigma Tau Delta, the Department of English & Theatre, the CAS Dean, the Office of Research and Sponsored Programs together fully funded this important work. In 2016, Sigma Tau Delta held its annual convention in Minneapolis, Minnesota. Three of our student members traveled to read their original work: Elizabeth Polishan ("Mythology and Maritime Archaeology: Molly as Calypso", "The other side of Despair"), Peter Shaver ("'Ode to a Nightingale 'and' A Darkling Thrush'") and Cailin Potami ("'My Dear Mother': Female Bonding in All's Well'") which won 1st place in a special categry of essays on Shakespeare. 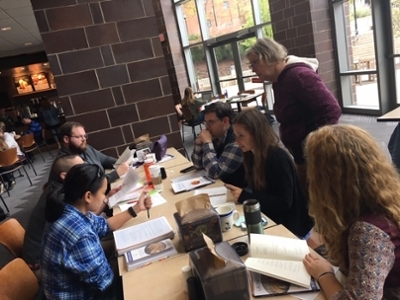 Our local Mu Omicron chapter of Sigma Tau Delta, the Department of English & Theatre, the CAS Dean, the Office of Research and Sponsored Programs together fully funded this important work. Louisville, Kentucky was the setting for the 2017 Sigma Tau Delta Convention. 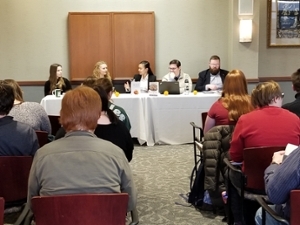 With support from our local Mu Omicron chapter, the Department of English & Theatre, the CAS Dean's Office and the Office of Research and Sponsored Programs, four of our students were fully funded for their original work. Peter Shaver ("Caliban and Friday: Affirmations of Colonialism"), Elizabeth Polishan ("The Stranger"), Christa Howarth ("Tolkien, Hagiographer and Sub-creator") and Alex Wasalinko ("Appropriation Writing: Take to (Re)Create"). Click here to see more photos and read about what our Sigma Tau Delta members are up to.